The guy on TV was zipping along in his Caddy. "Life is high school, with money," he said. Now that got my attention. Yes, in a way he's right. But that isn't going to make me want a Cadillac today. A big wad of money back in the '70s would have made for great fun. But today? Hey, I'm trying to de-accumulate by cleaning out years of clutter stacked along our basement walls. The thrill just isn't the same. If I'd had the loot back in high school, here's how I would have spent it (below). Even if it took every last dime. 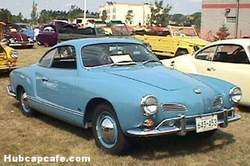 A Lake Lotawana friend had a Karmann Ghia just like this one. I drove it. And for some reason, it made me feel like Grace Slick.